Is the focus off? This photo was taken late at night. With the blanket done, I dove into another for-charity project: a Holden Shawlette. I started the shawl back at the beginning of August, but after zipping through the body, set it aside to work on The Blanket. This lace pattern looks very involved, but believe me–it’s not. Blanket out of the way, I picked it back up, and it zipped along. Even with the setback of discovering a weird disconnected stitch and having to rip out all the lace, this was a fast knit. Thank goodness: I have several projects with deadlines looming, and getting bogged down in another slow-building project would have sent me over the deep end. I want to thank Mindy Wilkes for being so cool and letting me knit her pattern for charity. 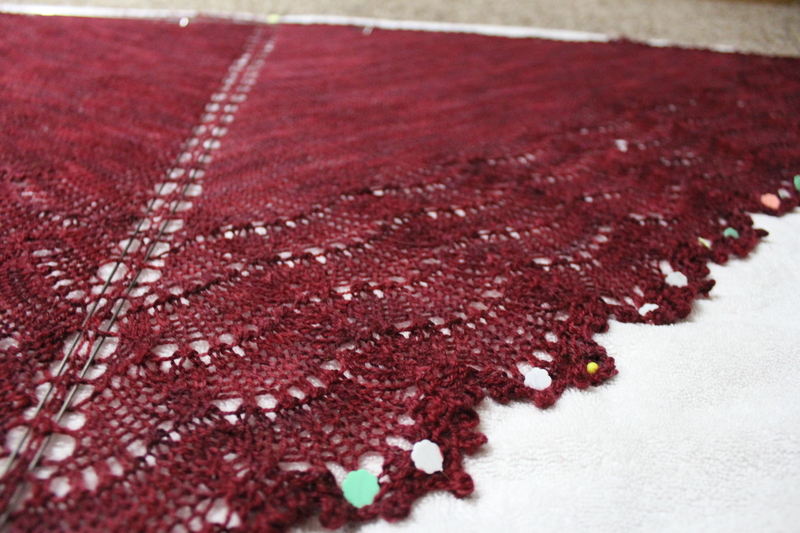 Once I get this little shawl unpinned, it is getting backed off to the people at the Arizona Library Association. It will be raffled off at the annual conference to support the Louise Stephens Scholarship for Arizona library students. For those of you who like specs, I regret to inform that I did not take notes on this project. It is very, very simple. Take a skein of sock yarn. Take a pair of size 6 needles (or size 7 if, like me, you have tight gauge). Follow the pattern. 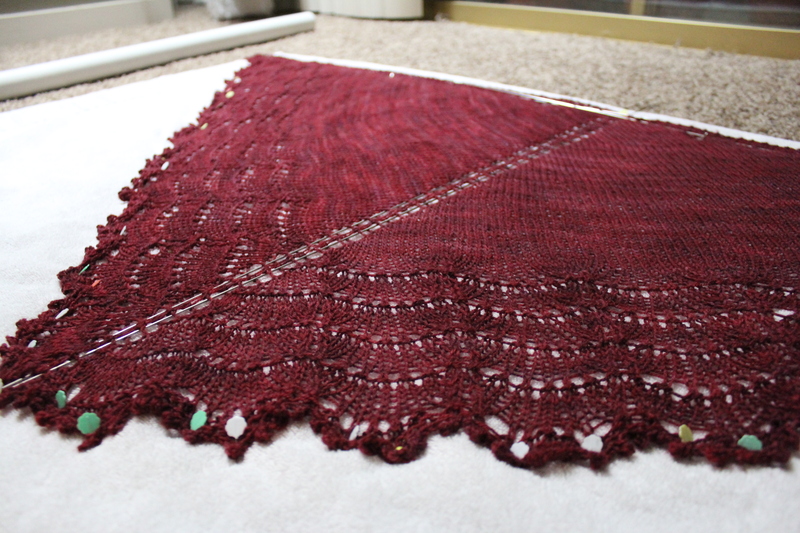 Weave in ends, block, and you have a shawl. It’s super simple. Wow, amazing. So much work!